A simple and basic symbol indicating one of the different possible directions. Tranferred into the domestic space, it becomes what it is: a customizable modular carpet with a pop soul. Flow is design in motion, a tide of fabric that breaks on the coloured beaches of its edges. It is difficult to resist the temptation to be lulled by its soft waves. Our handwoven Aura Line collection, made by 100% pure New Zealand wool, gives a strong and straight impression to all interiors. A striped rug may have a pattern composed of straight or serpentine bands, often parallel. The bands may vary in color, texture or gradient. Fabrics used include cotton, wool, silk and even leather. On ArchiExpo, these items are defined by properties such as style or material. 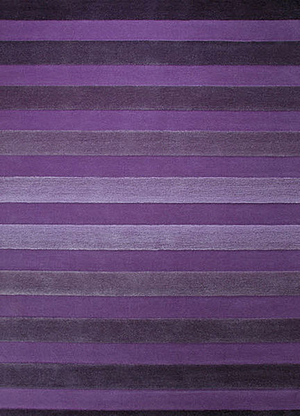 The advantage of striped rugs over plain is that the pattern helps conceal stains and dirt. This is particularly useful in commercial and other high-traffic areas or where dirt accumulates quickly, such as in children's rooms. As well as providing visual interest, stripes make the dimension perpendicular to them appear larger in small spaces. They may also lead the eye to specific areas or interesting objects. Decide whether the rug is to blend in or stand out from its surroundings, and whether the stripes will be of contrasting or complementary colors. Consider how the rug will alter perception of the space and whether the lines are intended to elongate the space, or to lead the eye to a piece of furniture or other focal point. Determine maintenance requirements. The color of the stripes, weave, material, cost and compliance with local regulations are factors to take into account. Rugs in high-traffic areas should be secured to the floor to avoid the risk of tripping. Rugs placed in corridors or transition spaces must allow doors to open freely.